Fatu , left, and Najin, right, the last two northern white rhinos on Earth. This is an important achievement, but no one breakthrough will save the northern white rhino despite what some headlines have suggested. A lot of incremental yet important scientific advances just may, though. After decades of poaching, there are only two northern white rhinos left on Earth, both female and infertile. 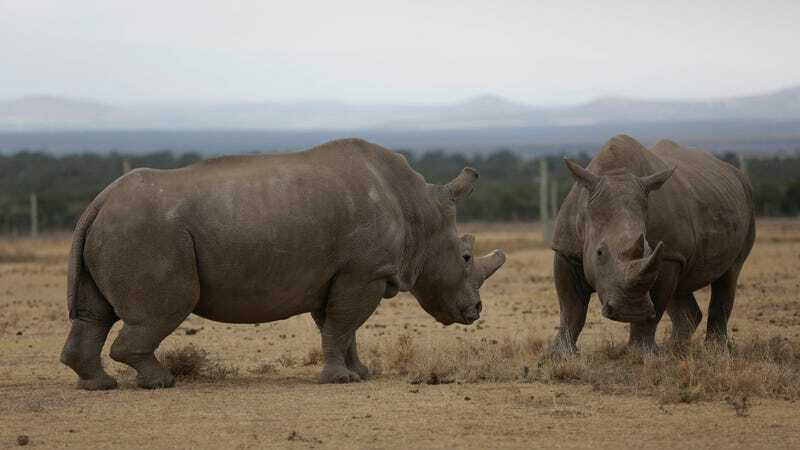 But a plan is afoot to rescue the subspecies by making northern white rhino embryos in the lab, implanting those embryos in southern white rhino females, and brining the northern babies to term. The creation of early-stage rhino embryos in vitro, published this week in Nature Communications, is a step toward that goal. The team at the Leibniz Institute for Zoo and Wildlife Research in Berlin harvested eggs from living southern white rhinos and mixed them with northern white sperm from a frozen tissue bank. They also mixed southern eggs and sperm to create fully southern white embryos, but the researchers did not produce northern white rhino embryos. To do that, they need to harvest northern white rhino eggs from the two surviving females, or transform other cell types into stem cells and then eggs in the lab. Nor are there any test tube rhino babies on the way just yet. These early-stage southern white rhino and hybrid embryos are now frozen while scientists work out how to safely transfer them to surrogate moms. Still, the embryos are an important step, as is the development of technology for harvesting eggs from rhinos. “It’s a remarkable step to have been able to collect ova, and then mature them in the laboratory so that they are sufficient to be fertilized and then can develop through the early embryo stages,” Oliver Ryder, a geneticist at San Diego Zoo and an architect of the roadmap for bringing back the northern white rhino, told Earther. Ryder’s colleagues also achieved an important milestone recently when they showed that existing northern white rhino cell lines have enough genetic diversity to support the recovery of a viable population. We’re still years to decades away from the new northern white rhinos being born, assuming there aren’t any insurmountable snags along the way. But even if the subspecies can’t be resurrected, this work might help save other large, endangered mammals on the brink. Researchers at the Leibniz Institute are already working to apply assisted reproduction technologies to the Sumatran rhino, which numbers fewer than 80 individuals in the wild.